If I told you to think of a truck, what comes to your mind? Many Pakistanis would visualise a Bedford truck. The majority of Bedford trucks seen in Pakistan are Bedford TJ’s. They have small round headlights, largely curved wheel arches and are often adorned with vivid truck art designs. These trucks are a very common sight on roads across the country. We do not stop to think: why are Bedford trucks so popular here? Why is a truck whose design is nearly as old as Pakistan itself, is still a preferred choice for truck drivers across the country? To answer these questions, we must look at the origins of the humble Bedford truck which helps transport everything from bananas to bricks. Ironically, the truck which has now become a Pakistani cultural icon was not originally conceived in Pakistan or for the Pakistani market in particular. Bedford Vehicles was a brand owned by General Motors, and its headquarters were in Luton, England. Luton is in the county of Bedfordshire, hence the name Bedford. Many Bedford trucks and busses have been in use in Pakistan, but the Bedford TJ truck, which was exported to many parts of the world throughout its production, has been most popular. In 1986, Pakistan’s Ministry of Production published a case study on the Bedford Truck according to which Bedford trucks were first imported and sold in Pakistan in the 1940s. The trucks gained popularity amongst buyers, and in 1953 National Motors Ltd. was established with the help of General Motors to start manufacturing Bedford and Vauxhall vehicles in Karachi. In 1963 National Motors was acquired by Ghandhara Industries Ltd. During the sixties, industrial growth in the country fuelled the demand for more and more Bedford trucks. Then in 1972, Ghandhara Industries, like other private companies, was nationalised and renamed National Motors Ltd. once again. 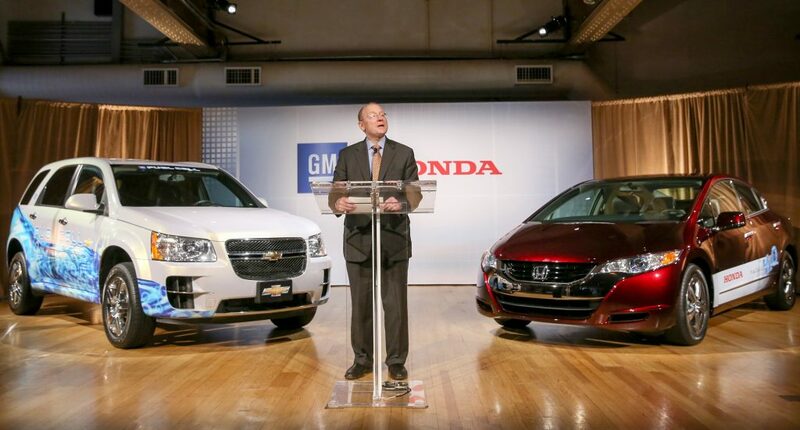 At this stage, even though the truck was assembled locally, only 20% of its components were manufactured locally. This figure was increased to around 65% by the mid-eighties. One of the reasons why the Bedford TJ is so popular in Pakistan till this day is that the truck is a near perfect match for Pakistani roads. Its relatively compact dimensions make it easy for drivers to manoeuvre it on twisty mountain roads as well as in narrow city streets. Its suspension copes adequately with rough roads, and local mechanics have modified it over the years to make it more compliant. The truck’s original load capacity was 9 tons. Pakistani mechanics have modified the trucks to carry up to 14 tons which is a very large capacity for a relatively compact truck. Travellers on the GT road would surely have noticed how overloaded some trucks can be. The trucks’ original engine was a 5420cc unit which produced just 90 bhp. Some truck owners turbocharged their trucks to produce over 130 bhp. Others eventually swapped the Bedford engines with Nissan Diesel and other modern engines. When Bedford trucks were being assembled in Pakistan, the government had imposed restrictions on the import of other trucks for some time. This also contributed to the success of Bedford trucks. When other trucks like Hino, Isuzu and Nissan were finally allowed to be imported, Bedford got a major competition. Their trucks were more fuel efficient, powerful, reliable and had the larger load carrying capacities and better suspensions. Even though these trucks were mechanically more advanced than Bedford, Bedford parts were more easily available along with the easy access to workshops which had opened up to service Bedford trucks along the GT Road and other routes. In fact, many truck drivers knew how to mend Bedford trucks on their own. It was evident that many peoples’ livelihoods depended on these trucks and these trucks were not going to give in to competition so easily. 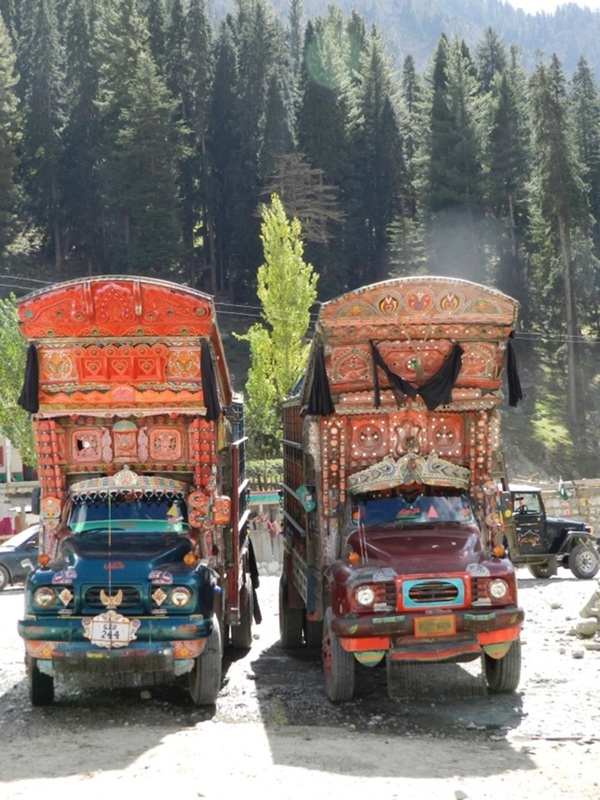 Two Bedford trucks in Kalam, Swat. This is how Bedford trucks gained a huge market share, but a huge market share is not what made them a “cultural icon”. I believe that truck art is what transformed the Bedford Truck from an ordinary commercial vehicle into a cultural icon. I should clarify that truck art is not exclusive to Bedford; many different trucks, buses and wagons have been decorated in truck art. Pakistani truck art originated in the 1940s when truck drivers began painting pictures of spiritual leaders on their trucks. Now truck art includes colourful landscapes, portraits of famous personalities, animals and witty poetry painted on trucks. To complement these, trucks will have dangling chains, colourful antennas, extruding hubcaps, tiny decorative mirrors, shockingly loud and melodious horns and most recently a plethora of LED lights. Drivers believe that the more beautiful their truck is, the better they are. Their trucks are their pride and honour. Bedford trucks decorated with truck art – and this is subjective – look more beautiful than any other type of truck. All trucks, buses, rickshaws, chairs, shoes and even tea-trays look gorgeous in truck art, but the Bedford truck carries out the look like nothing else. To me, it looks charming, which is hardly a word one would use to describe a truck. 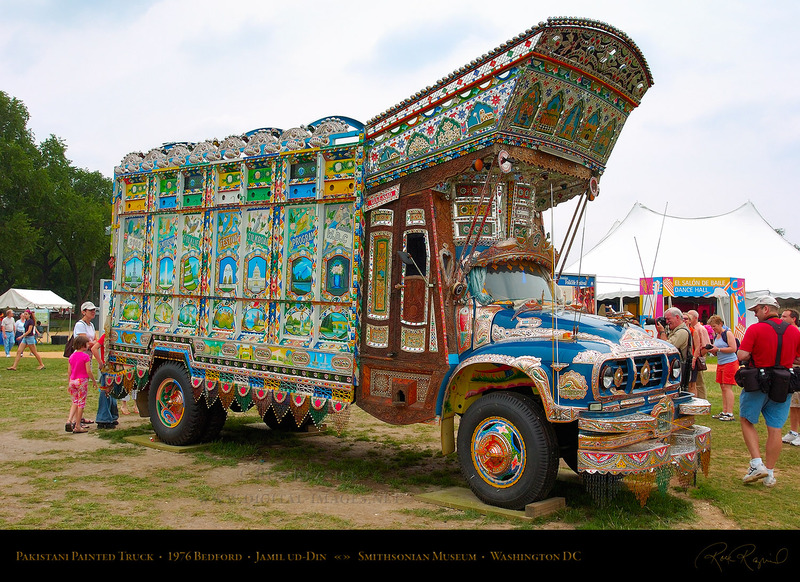 Bedford trucks decorated by Pakistani truck artists have been exhibited around the world. 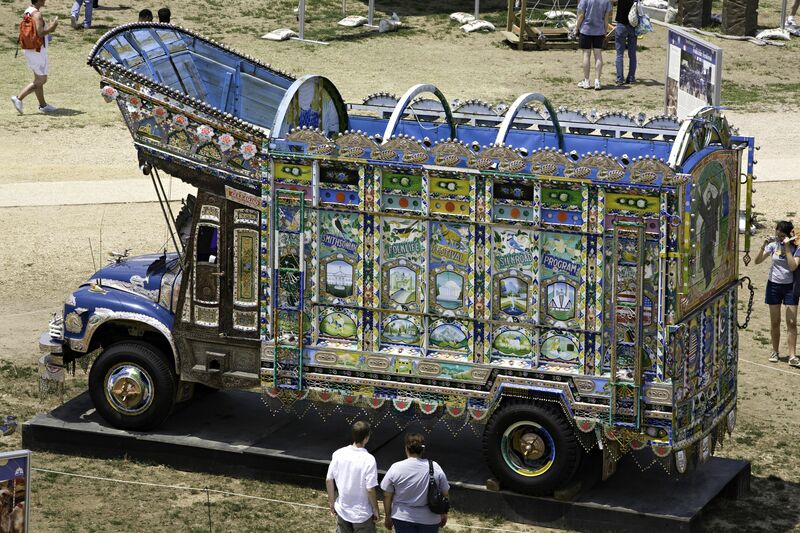 One such truck was exhibited at the Smithsonian Institution in Washington D.C., another in Luton by a charity called Luton Culture. And closer to home, a green Bedford truck is a permanent exhibit at Lok Virsa, Islamabad. Do not be deceived by the Toyota emblem; this is also a Bedford. Photo by the author. The Bedford TJ Trucks were eventually phased out of production, and the Bedford brand was absorbed into the Vauxhall brand by General Motors. 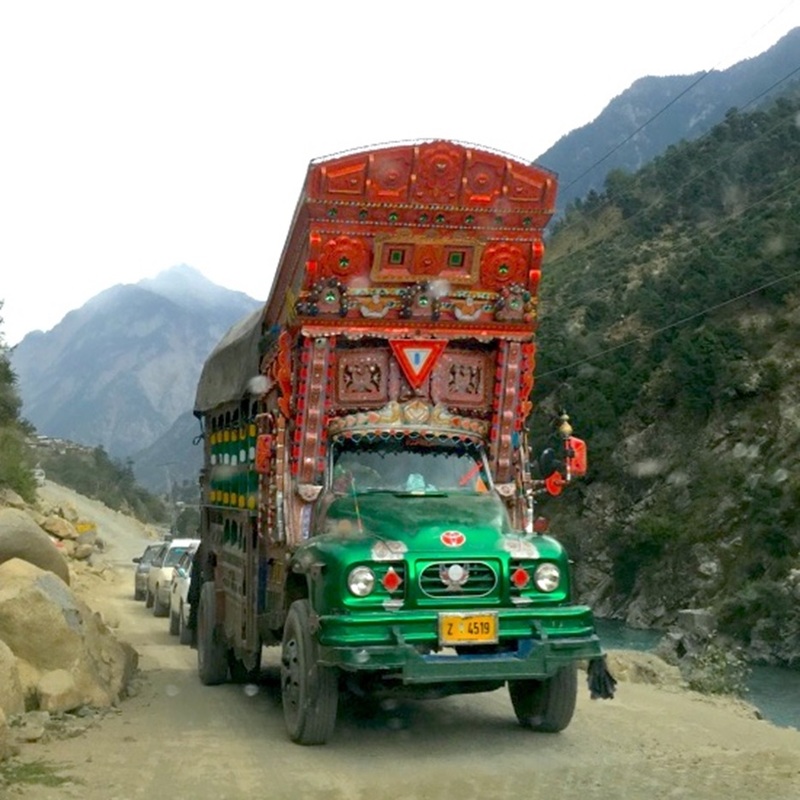 Japanese trucks became the large sellers in the Pakistani market and are now in competition with Chinese trucks. Daimler AG has also signed an MOU for the assembly of Mercedes-Benz trucks in Pakistan. Today, Ghandhara Industries Ltd. sells Isuzu trucks. Despite these developments, there are still thousands of Bedford trucks still on the roads today. 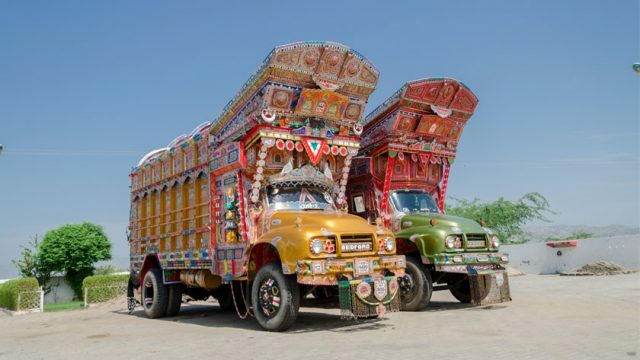 They should be cherished and preserved for Bedford trucks decorated in truck art help project the richness of Pakistani culture in a positive light. The writer is a student studying computer science. He enjoys watching car shows, reading car magazines, driving and painting.